I’m tasking myself with taking different programming topics and breaking them down so well that a kid could understand it. Because I could use a refresher myself and I’m sure this will help a lot of new programmers or existing programmers get better at what they do. I figure, if my dad who has no idea what a computer is in 2018 can understand this than anyone can. I genuinely enjoy helping people understand things better and find myself offering advice often. My friends say I’m a good listener and I explain things well. I’ve been like this since I was a kid. I remember finishing my work before the rest of the class almost daily. I would then spend the rest of the time tying to help my classmates catch up and understand their work because I was just that kind of team player. Since I enjoyed helping people after elementary school I spent some time in high school and college tutoring peers and kids younger than me. There’s this joy I get every time I help someone complete a project or I see that “aahhhhhhhh I get it” in someone’s eyes. First Stab – What is Programming? 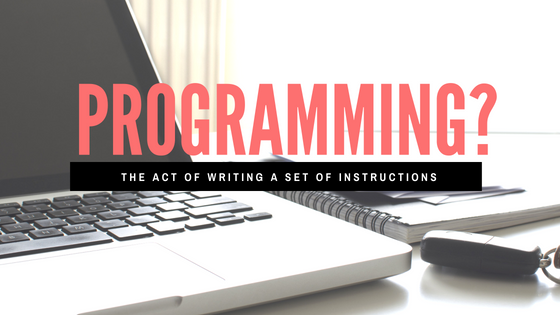 Programming is the act of writing a set of instructions that will be used to perform a specific task. Stay tuned for new topics! If you would like a specific topic explained drop a comment below. I would love to hear your feedback!